﻿Considering that he's released a pair of undisputed masterpieces and established himself as something of an alternative icon over the past four years, the lack of young bands willing to follow Justin Vernon's lead seems somewhat curious. Yes, the luscious and dreamlike folk that the Bon Iver mainman purveys is of the very highest order in both it's taste and it's sophistication, but that doesn't usually stop hordes of newer acts taking cue from the latest musical phenomena. No matter the reasoning, the relative lack of similar artists has meant that those that do exist haven't found their way blocked by saturation, and it's because of that that bands such as And The Giraffe sound genuinely refreshing rather than like tiresome also-rans. Let's get one thing straight; dismissing Nick Roberts and Josh Morris - the band's collective masterminds - as Bon Iver copyists would be well short of the mark. Their brand of solemn, cinematic folk music treads very much along the same lines, but there are a number of marked differences which could see them forge a distinct sound in their own right. In fact, a superior point of comparison for this debut EP would probably be Iron & Wine, firstly due to the relatively upbeat nature of their music and secondly due to the fact that both members possess effortlessly chilled voices not dissimilar to Sam Beam's, attributes which suit their style to perfection. In all honesty, one could go so far as to say that the sound they've crafted on Something For Someone is virtually flawless, with the only real weakness lying in the actual songs that they've composed. None of them are bad per se, but too often they simply pass by without making much of an impression, usually the result of either a lack of genuine hooks or cohesive structure - though opener 'Underground Love' does provide a notable exception. It sounds like a pretty big drawback, and it's no doubt an element that you'd want them to polish up in the future, but in the grand scheme of things it fades to insignificance when you consider how much the duo have achieved in other areas of this release. 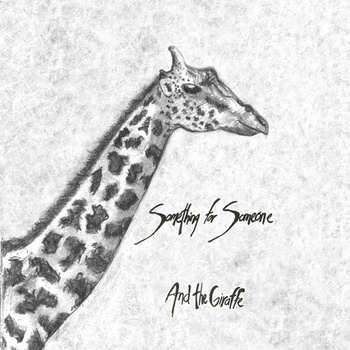 Indeed the discipline required to make this type of music successfully is scarce even among most established acts, so the gusto with which And The Giraffe pull it off is nothing short of sensational. It's true that for the moment at least their vibe is a lot more enjoyable than their actual songs, but there's blatant talent here from which great things could conceivably arise. "We're gonna be big stars some day" sings Morris on closing track 'Still,' and if the pair can establish an upward trajectory there seems no reason why that lyric can't ring true in the future. You can download Something For Someone (name your own price) or purchase it physically on And The Giraffe's Bandcamp page.